In early 2016, Ghana Health Services (GHS) requested the One Million Community Health Workers (1mCHW) Campaign to assist in promoting awareness of trending health issues in Ghana. 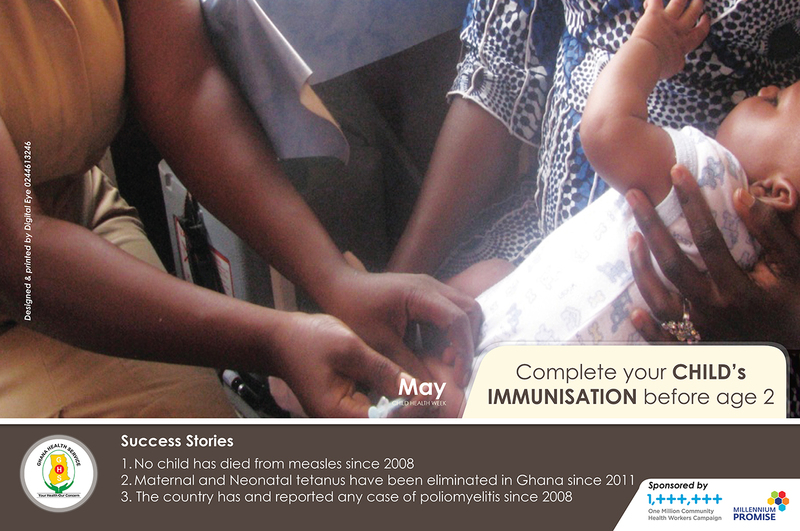 In May 2016, diverse health posters were displayed on the walls of the GHS Headquarters along the road between the office and a commercial business area at a central business district popularly called ‘Tema Station’. GHS’s mandate is to provide quality and accessible health services to Ghanaians from the regional to community level.The posters form a part of this mandate by encouraging Ghanaians to be proactive in improving their health. The posters provide informative and educational health advice on various public health concerns and diseases, from breast self-examination to following a healthy diet and regular exercise. 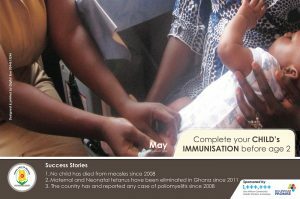 These posters also form a part of the 1mCHW Campaign’s advocacy work in addressing global health issues by underscoring the importance of CHW’s in bringing health to ‘Hard to Reach’ rural areas of the country.